Do you write HTML code manually? Would you like to have meta date values calculated for you? 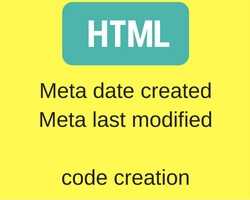 Include meta values for last modified, created and expires. Copy and paste code from here. e.g. meta http-equiv="date" content="Wed, 04 Apr 2016 20:00:00 GMT"
e.g. meta http-equiv="last-modified" content="Wed, 04 Apr 2016 20:00:00 GMT"
e.g. meta http-equiv="expires" content="Thu, 03 May 2016 05:43:16 GMT"
How many days into the future does the web page expire? e.g. meta http-equiv="date" content="Fri, 14 May 2016 01:24:39 GMT"
How many days in the past was the web page created?